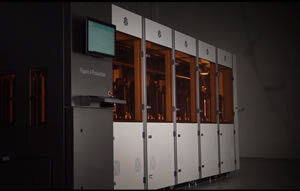 Larry Dignan for ZDNet: 3D Systems outlined plans to better target industry-specific additive manufacturing through new materials, systems, software and services. The company's focus on additive manufacturing comes a week after 3D Systems missed its earnings target and pulled it outlook. Vyomesh Joshi, CEO of 3D Systems and former HP executive, said the company is focused on customized innovation and a go-to-market strategy that goes "vertical to vertical, bridging the chasm between traditional and additive manufacturing."